“New findings from Aalto University have the potential to change how electronics process logic functions, the elementary building blocks of computing. Our daily lives rely on electronic processors, which perform the basic arithmetic, logical, and control operations that make devices from mobile phones to smart TVs possible. Current technologies are, however, approaching their limits and researchers around the world are looking to enable the next generation of computing. In their paper now published in Science Advances, an interdisciplinary team of researchers at Aalto University show how a new type of nanowire-based nanostructure enables light to perform logic functions, allowing simple addition and subtraction operations. The study, the first to demonstrate nanoscale all-optical logic circuits, provides a vital step in the journey towards true optical computing. ‘We’re able to perform binary number calculations and show, for instance, how this nanostructure can carry out these functions just like a simple pocket calculator—except that instead of using electricity, the nanostructure uses only light in its operation,’ says Dr. Henri Jussila, who completed a post-doc at the university on the topic. To build the nanostructure, the team took a novel approach to assemble two different semiconductor nanowires, indium phosphide and aluminum gallium arsenide. The nanowires, both shorter and exponentially thinner than the diameter of a human hair, have a unique one-dimensional structure, which allows them to function like nanosized antennas for light. ‘We used a simple combing technique, similar to how people comb their hair in the morning, to assemble these nanostructures,’ explains Jussila. With this mechanical combing method, nanowires can be aligned in any specific direction, which differs from the as-fabricated randomly aligned nanowires typically used. Repetition, however, is key to getting the antennas into ideal alignment. ‘Repeating the combing method allows us to build integrated devices of nanostructures in which two different types of nanowires are perpendicular to each other,’ says Professor Zhipei Sun, who leads the Photonics group at Aalto University. ’The one-dimensional and crossbar structures are the core of our calculations because they enable the input light to choose which nanowire it interacts with—either the indium phosphide or the aluminum gallium arsenide,’ adds Dr. He Yang. 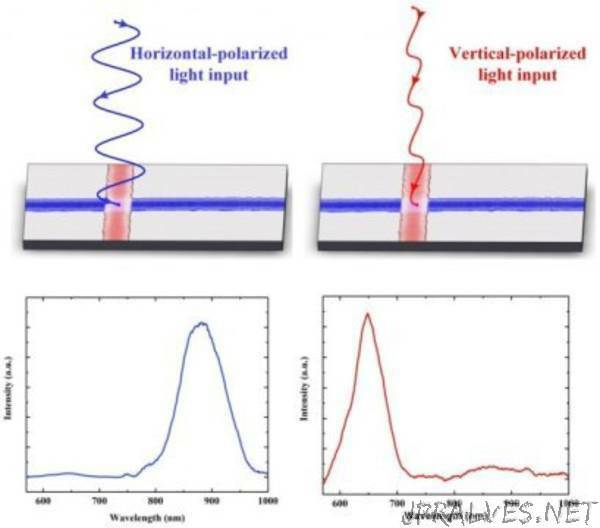 Depending on the input, in this case the linearly-polarized light direction and its wavelength, the nanowires either interact with the input light or not. This is similar in practice to how the antennas used in old radio receivers work; they only receive signals when pointing in the optimal direction, typically upwards. Since the response of the different nanomaterials is different, the light output of the fabricated nanowire structure can be switched with different wavelengths and light direction for the successful realization of logic operations.